Growing number of managerial level profiles in India has developed a high demand for Executive MBA courses. Not only regular institutions but many of the distance education colleges are offering Executive MBA in India through distance learning mode. An Executive MBA programme allows working professionals to earn a MBA degree or any other business degree mostly in one year without leaving their job. In our today's post we're gonna tell you about popular institutions in India offering emba courses through distance learning mode. These kind of programmes are specially designed for working executives who has an extensive work experience ranges between 2-10 years. People opt for these courses to upgrade their skills including decision making & managerial skills. Some people also prefer EMBA to get a promotion in their current job. Following are the advantages for doing an Executive MBA in India through Distance Learning Mode. You can easily get an MBA degree without leaving your current job. Study at your preferred timings from the ease of your home using books or online study material. You can clear your doubts by attending personal contact programs conducted by the institution time to time. Get access to online study material & specially designed books. Get a degree which is as acceptable in the business world as a regular degree. 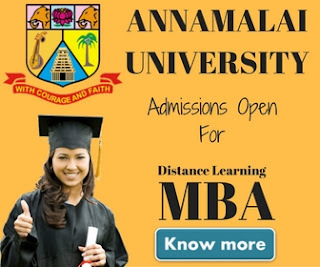 Executive MBA in India through distance education are cheaper compare to other part of the world. If you're planning to pursue Executive MBA while doing your job, following are the best institutions in India offer such courses. This list is just to give you a reference about such colleges. We strongly advice our blog readers to make clear any doubt they have about these courses from the respective university. 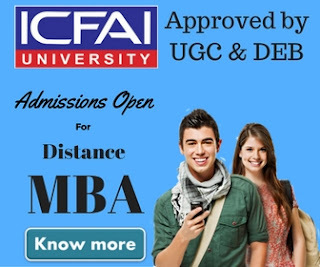 ICFAI University offers a 2 years Executive MBA course for experienced working professionals through distance learning mode. Any graduate with 50% marks & minimum 6 years of working experience may apply for this emba course. CAs / CWAs / CFAs / CS with minimum 3 years experience may also apply for Executive MBA from ICFAI. The programme is focused on case study based learning & out of 20 courses included in the subject 13 are case study based and two other are mandatory workshops. ICFAI also use CAT-XL (concepts, applications, trends – experiential learning) framework to enhance the learning process of its Executive MBA program. You can get the more information about ICFAI EMBA Course here. A well known university located in Noida, Uttar Pradesh, India, known as Amity University also offer Executive MBA courses for working executives. The university offers specialized Executive MBA courses Business Management, Advertising & Brand Management & Insurance Management. These courses are one year in duration and require past 3 years of education under English medium or TOEFL score to be eligible for this course if candidate first language is not English. The fee of these courses is 21600 for both of the semester. For more information about these courses must visit Amity University EMBA Courses. Bharati Vidyapeeth Deemed University also offer an Executive MBA in India. The duration of the course is 1.5 years. Students with a graduation degree in any discipline from a recognized university with 5 years of working experience may apply for this course. Students may obtain application forms with prospectus from university office at A/6 Paschim Vihar New Delhi. More information about the course may be obtain from here. Don bosco university, Assam also offer 18 months Executive MBA in India. The course has been divided into 3 semesters which has to be completed maximum of 3 years time, the minimum time a candidate may take to complete the programme is 1.5 years. To be eligible for the programme, a candidate must have a bachelor degree along with minimum 3 years of working experience on Managerial / Supervisory / Professional Role. The course has been designed to develop Management, Leadership, Strategy and Innovation skills into the candidate. For more information about the course student may visit here. Madras University Distance Education also offer Executive MBA programme. The programme has been divided into 4 semester. The candidate must have a graduation level degree from a recognized university with minimum 3 years of experience on managerial / supervisory / executive profile. Madras University is one of the reliable university to pursue Executive MBA in India. the course fee for first year is Rs.25,000/-. For more details about the course you may visit Madras University official website. Above we've mentioned top 5 universities in India offering distance learning Executive MBA in India. If you've any question or query, please visit our contact us section or contact directly to the respective university.